When Steve Jobs announced the iPad way back in January, the machine not only marked a whole new computing area for Apple, it also gave third-party manufacturers a brand-new toy to accessorise. It's surprising, then, that it's taken this long for a handful of iPad docks to come to the market. While the Bang & Olufsen BeoSound 8 was very much a premium product, the latest iPad dock TechRadar has gotten its hands most definitely caters to the mainstream. 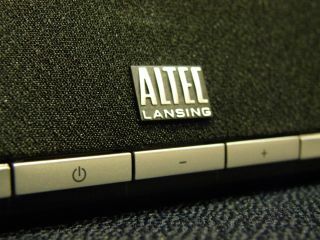 Altec Lansing has been one of the big names in the dock market, offering decent functionality at a reasonable price. The Altec Lansing Octiv 450 is of no exception. What's surprising about the dock is its footprint. The base of the Octiv 450 is smaller than you would imagine an iPad dock to be. This is because it has been designed to make sure that the iPad is pride and place on the dock, with the stand sitting behind it. Within the base is the speaker system. The speaker stretches round the base and makes good use of the sound – which is crisp and clear. The iPad slides easily into the cradle of the dock and the back is large enough to make the iPad feel secure in the device. Not once did we feel the iPad was to big for the dock. The cradle arm will also hold the iPad in both landscape and portrait mode. A gentle turn of the cradle will achieve this. When it comes to connectivity, the dock has the obligatory 30-pin connector that also acts as a charger and there is a 3.5mm jack on the back for any other device you want to plug in. Altec Lansing has created something special with the Octiv 450. It's a device that suits the iPad well and wouldn't look out of place in your kitchen, bedroom or even living room. The iPad isn't as portable as Jobs and co would want you to believe, so connecting it to a dock makes a lot of sense, and the Octiv 450 does everything right in an accessory market it's pretty much created. The Altec Lansing Octiv 450 audio dock has a UK release date of 1 December and is priced at £129.99.